Download your free copy of the definitive guide to civic crowdfunding for local authorities here. Cities are increasingly using crowdfunding to democratise the way places are created and funded: from new street markets and revamped playgrounds, to gardens planted on derelict railway lines. This new report from Future Cities Catapult studies the progress of the first wave of local authorities making use of this approach, highlighting the challenges and opportunities of doing so. The crowdfunding phenomenon, made famous by companies such as Kickstarter and Indigogo, is revolutionising the world of alternative finance by harnessing the power of microdonations to finance projects, products and services. The subdomain of civic crowdfunding represents not only an opportunity to secure funds and complete projects but also a way to forge partnerships between government bodies, businesses and citizens, and to foster the development of local communities. With implications that go far beyond raising funds, civic crowdfunding has the potential to revolutionise community participation in local public affairs. Why is it being adopted by local authorities? How can local authorities get involved? The term ‘civic crowdfunding’ refers to a subcategory of crowdfunding through which ‘citizens, often in collaboration with government, propose, fund and deliver projects that aim to provide a community service or deliver public value through a local-area-improvement project.’ Typically, project ideas are sourced from the crowd and placed on Internet-based platforms, where potential funders are able to search and make financial contributions to projects that resonate with their areas of interest or values. Together, these actions represent a new model of community involvement, allowing citizens to take an active role in the physical improvement of neighbourhoods. This guidebook outlines the various types of civic crowdfunding financing models, the types of project that are typically funded and how civic crowdfunding fits among traditional funding sources. The ability to leverage additional funds towards local-area-improvement projects. A new approach to citizen engagement and involvement. The ability to inform smarter investment decisions. The ability to increase innovation and experimentation while reducing risk and cost of failure. While it is often the financial benefits that initially entice authorities to adopt civic crowdfunding, as involvement progresses, authorities invariably find that the social benefits outweigh any financial gains. In particular, the new approach to citizen engagement and participation enabled by civic crowdfunding becomes very valuable to authorities. Citizens have been expressing a desire to have a more participatory role in government decision-making, particularly in the planning and budget allocation processes. Civic crowdfunding enables a more proactive approach to citizen engagement and participation, providing an opportunity for citizens to propose, contribute to and participate in projects that reflect their own values and areas of interest. Civic crowdfunding essentially facilitates a marketplace-led model, where citizen demands and institutional supply can meet more effectively. This guidebook provides a detailed analysis of the various quantifiable and unquantifiable, economic and social benefits delivered by civic crowdfunding initiatives. Local authorities tend to follow a similar path to adopting civic crowdfunding approaches. Passive Observer: All authorities start their journey as ‘passive observers’. At this stage, authorities are largely unaware of the civic crowdfunding domain, and how it can apply to them. Currently, approximately 90% of authorities across the UK are at this stage. Active Supporter: Once authorities have reached a heightened point of awareness, they typically progress to an ‘active supporter’ phase, in which they receive briefings from service providers and begin to engage with the community on the topic. By the end of this phase, authorities are beginning to build a low-key digital presence, which announces that the authority is active in this area. Catalyser of Activity: Once a digital presence has been established and the authority is growing in confidence, it enters the third phase of progress, a ‘catalyser of activity’. Authorities quickly find that creating an online presence is not enough to encourage individuals and organisations to engage, they must work to catalyse activity. These activities can range from offering matching funding to project creators, providing training, capacity building and support services and conducting marketing and PR activities. At the end of this stage, an authority will have created an active and engaged ecosystem surrounding their civic crowdfunding initiative. Confident Leader: The final stage reached is the ‘confident leader’. At this stage, an authority’s crowdfunding ecosystem is functioning well and is beginning to deliver expected benefits. To upscale the initiative further, officers within authorities often seek to get senior level buy-in and endorsement, and conduct evaluation exercises to quantify the value being delivered. Authorities at this stage are also able to mentor other authorities in how to set up an initiative. 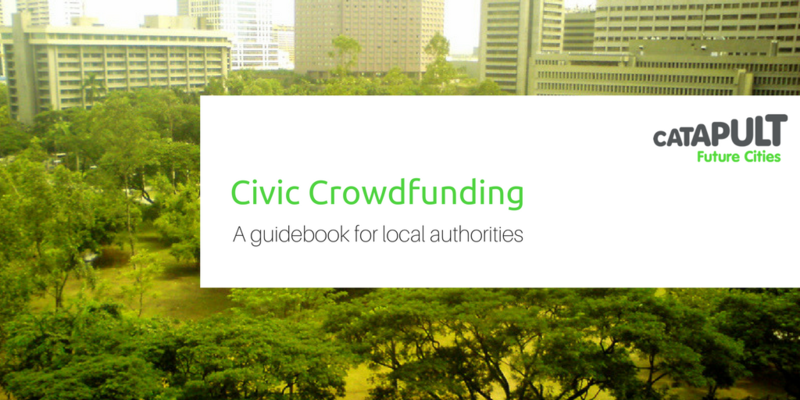 This guidebook provides a generalised account of the path local authorities typically traverse when adopting civic crowdfunding approaches, including the actions and activities that an authority is required to take at each phase. The guidebook then illustrates this journey with several real-life case studies from local authorities across the UK. While civic crowdfunding may have begun as a method of alternative finance, its true implications go far beyond fund-raising. From a citizen perspective, it provides a far more robust and satisfactory method for involvement in civic affairs. From an authority standpoint, it is able to foster more engaged and resilient communities and the projects it supports and funds will be more alert to public demand. While civic crowdfunding initiatives are currently often siloed from the main activities and responsibilities of the authority while learning takes place and confidence grows, there is an expectation that in the future crowdfunding and crowdsourcing approaches could be integrated and used more widely across the authority. The diversity of projects delivered through civic crowdfunding suggests that the approach has the potential to develop in a myriad of ways to accommodate the various needs of both citizens and their local authorities, eventually becoming the de facto method to assign council resources and budget to local-area-improvement projects. It is hoped that by equipping local authorities with knowledge around this subject area as well as a template for involvement, adoption of civic crowdfunding approaches will increase, leading to stronger communities, more attractive neighbourhoods and a more democratic approach to community engagement and participation. 1.1 What is civic crowdfunding? 1.2 What are the key characteristics of civic crowdfunding projects, campaigns and movements? 1.3 Where does civic crowdfunding fit amongst traditional institutional funding models? 1.4 What crowdfunding models are appropriate for civic projects? 2. Why are local authorities adopting civic crowdfunding? 3. How can local authorities get involved? 4.1 What are the potential issues with civic crowdfunding? 5.1 What is next for civic crowdfunding?